Arctic Berry Radiance Cream Review (2018): Is It Worth Buying? Eminence Arctic Berry Peptide Radiance Cream Review: Should You Buy This moisturizer? Eminence Arctic Berry Peptide Radiance Cream, US $90 for a 60 ml jar, infused with the proprietary Peptide Illuminating Complex, this moisturizer is made for daily day time application and formulated to transform your complexion to its healthiest glow ever. About Eminence Arctic Berry Peptide Radiance Cream — Does It Really Work? This product is brought by Eminence Organics, a skin care brand founded and based in Hungary. This label is committed to formulating and distributing products that are rid of SLS, synthetic dyes, artificial fragrances, and hormone-disrupting parabens. All Eminence Organics products are also certified vegan. All raw materials used in Eminence Organics products are sourced from farms that utilize sustainable farming technologies. What Are The Ingredients In Eminence Arctic Berry Peptide Radiance Cream? 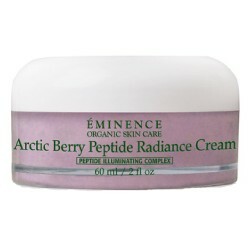 Eminence Arctic Berry Peptide Radiance Cream must be used on freshly cleansed skin. Apply a single layer for a sheer application and double up for deeper hydration. This product is loaded with antioxidants that simultaneously revive your skin, giving it life, and protect it from further damage. This product is significantly more expensive than comparable moisturizers. Eminence Arctic Berry Peptide Radiance Cream reviews indicate that this is not well suited for use of people with dry skin types. Does Eminence Arctic Berry Peptide Radiance Cream Have Any Side Effects? Based on the ingredients and reviews, the skin irritation due to several ingredients, including botanical ingredients, are the only side effects that can be expected when using Eminence Arctic Berry Peptide Radiance Cream. Make sure to perform a patch test to check for any allergic reactions that you may have against one or more of this product’s components. Eminence Arctic Berry Peptide Radiance Cream is a relatively cleaner formulated moisturizer that only mostly contains naturally sourced ingredients. However, keep in mind that natural isn’t always better, most especially when you have sensitive or extremely reactive skin because botanical ingredients can be highly irritating.